Horizon will debut a home fuel cell charger at CES this week in Las Vegas, Nevada. Horizon touts the kit as a small step on the way to a "hydrogen economy"
(CNET) -- The route to clean energy is through small gadgets, according to fuel cell company Horizon Fuel Cell Technologies. The company on Monday said it will show the Hydrofill, a home fuel cell suitable for charging small electronics at the Consumer Electronics Show, which starts later this week. The product will be available later in 2010. The "desktop" fuel cell extracts hydrogen gas from water and stores it in cartridges with a metal alloy that absorb the hydrogen. To charge electronic devices, people use a pocket-size fuel cell charger, called the MiniPak, which pulls hydrogen from the cartridges and a produces an electrical current. The kit comes with a USB charger and cell phone adapter and the company offers an optional AA-battery charger. Horizon Fuel Cell Technologies is touting the kit as a small step on the way to the so-called hydrogen economy, where hydrogen is an energy carrier and fuel cells make electricity. It already offers a larger off-grid portable charging system which uses the same basic technology and plans to expand into other areas, such as gardening equipment. The Hydrofill system for electronics is clean during use because the chemical reaction that happens in hydrogen fuel cells only produces water vapor and no air pollutants. 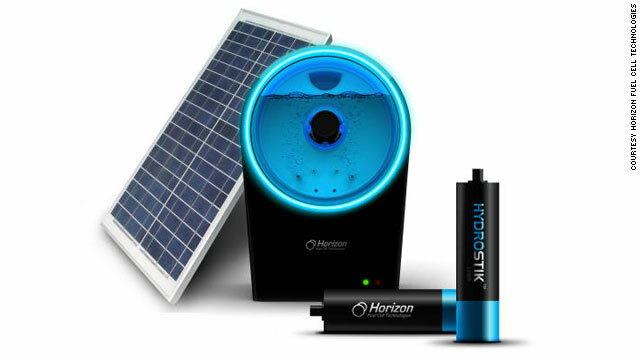 To initially charge the hydrogen cartridges, which are called Hydrostiks, people either plug it into an electrical outlet or use a small solar panel. It's also compatible with small wind turbines. The system can pump out 2.5 watts of power, making them suitable for smart phones, small digital cameras, GPS units, and cell phones that typically use 5-volt USB chargers. Expected pricing for the Hydrofill and related components wasn't immediately available.